A beautiful sunny day in St. Petersburg-our guide said it was one of just 30 or 40 in the whole year! Actually the day before the rain stopped midday and the sun came out then also and it didn't set until about 10:30 pm! We started our tour with a wonderful river boat ride through the rivers of the central city including the main Neva River. Many great views and many low bridges just like on the Erie Canal. They are all drawbridges but were built low so not to mar the views. The bridges are up for about 4 hours in the middle of the night for boats and if you get stranded on the wrong side you are in trouble! The bridges are so low that you had to sit when going through and we had to yell at one of our fellow passengers to get down fast! Next it was off to the Hermitage Museum which Catherine the Great had built-she was married to Peter the Great's grandson and had him killed off and went on to do great things for the city and Russia according to Russians-I suppose it would depend on whether you were a surf or servant or not. This museum is second in size to the Louvre in Paris and is enormous. We saw many of the mind boggling reception rooms of the palace as well as some of the most famous works in the huge collection. Since we were there before the public it wasn't too crowded and a perfect visit. 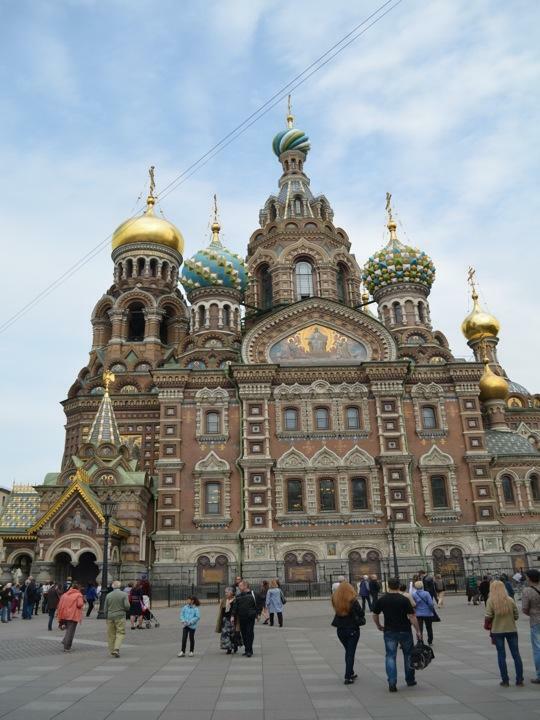 Then it was off to the Church of Spilled Blood-marking the spot where Nicholas was murdered and where all the Russian royalty is buried. It is covered in amazing mosaics-the most in the world of any building. Catherine and her husband-the one she had killed are buried side by side and have matching tombs! Another lunch in a Russian restaurant with chicken Kiev-quite good, a city tour and then a ride on the subway-sounds strange but it was great if a little terrifying for me. Because St. Petersburg is built on marshes and there are many rivers it is very deep. The down escalator was over 300 feet down and I hung on for dear life and then I was afraid of getting lost in the subway separate from our group but all was well. The subway stations are marble and decorated with beautiful mosaics! Just like NYC not! As we bid farewell to Alexandra she left us with the admonition that we should remember that "St. Petersburg is much better than Moscow." Returned to the ship in time to see a local Russian folkloric group singing and dancing! They were quite good.